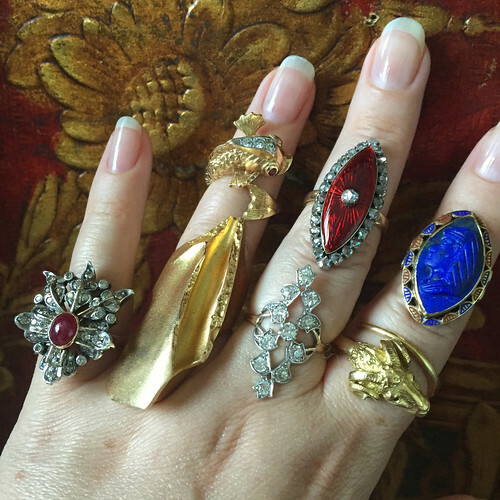 I inherited the jewelry fever from my mother who is pragmatic and no-nonsense in most every other way but still wants her jewels. 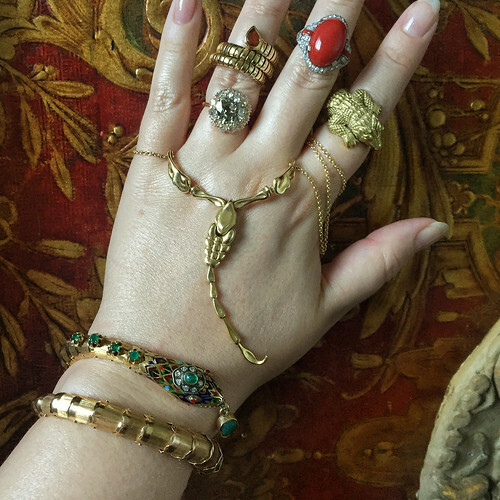 My father was happy to oblige her with some beautiful antique pieces they picked out together for special occasions and she has no qualms about filling the gaps in her collection herself. 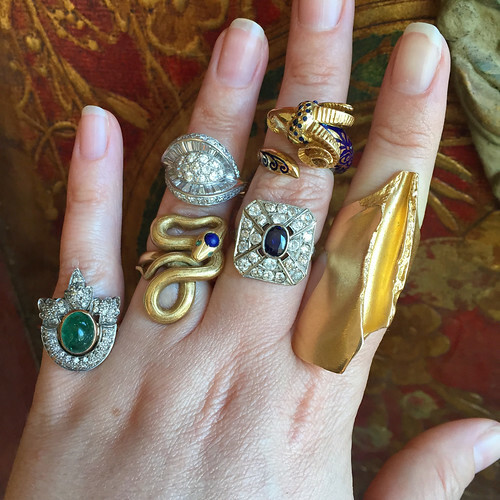 She recently bought an outrageous Edwardian emerald and diamond three stone ring at the Hillsborough Antique Show that I lust after constantly. 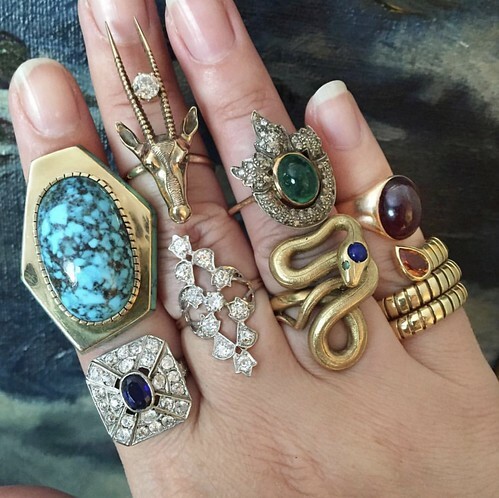 I collected vintage Gucci bags from the 1960’s and 1970’s for many years (I still own and love them) before I started to transition more to jewelry over a decade ago when I could afford some of the pieces I wanted. There is something I love in every era but I always look for big, evocative, narrative pieces. I did visuals for retailer Anthropologie for a very long time and jewelry is an integral part of my bougie-boho aesthetic. Dainty pieces just disappear on me (although I love admiring them on other people). 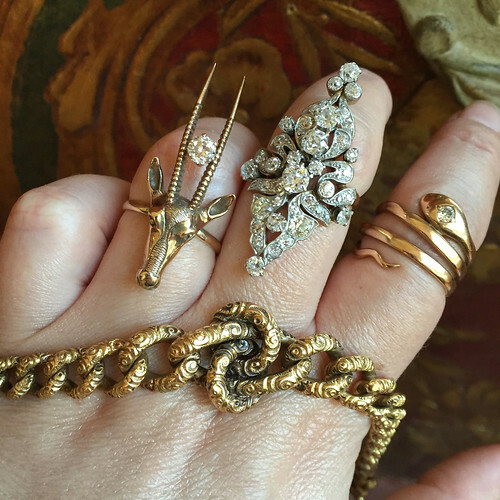 I love figurative animal jewelry and have acquired everything from Victorian snakes to a 1980’s Kieselstien-Cord alligator ring to my contemporary Elsa Peretti scorpion necklace. 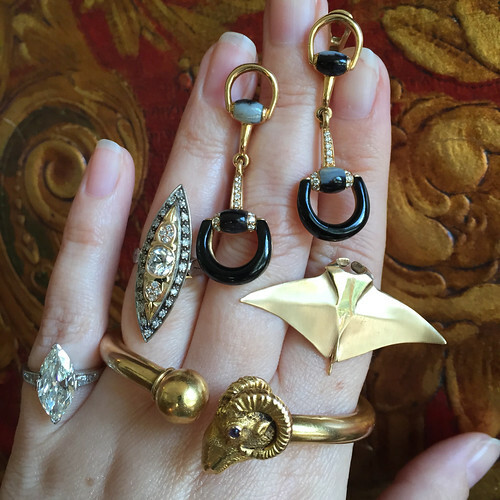 Another one of my favorite pieces is a long Edwardian diamond ring that I first lusted over on a fellow Instagramer. When Danielle at Gem Gossip posted that the owner was letting it go, I jumped on it. There have been studies that people get more gratification from spending money on experiences rather than objects. To me beautiful jewelry is both an object and an experience every time you wear it. Rings are my favorite because you can admire them while you wear them. I love the craftsmanship- the touch of the hand. There is an emotional connection to a piece that was exquisitely made. 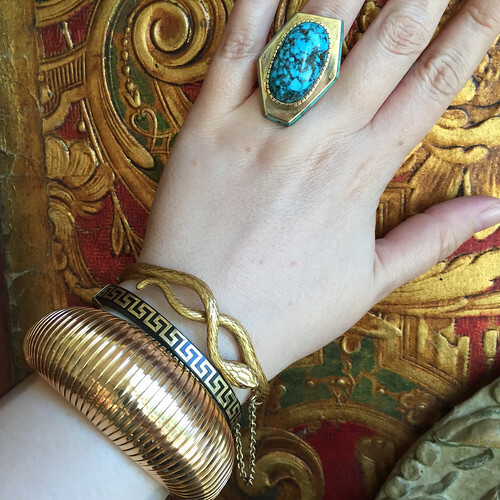 I also love that jewelry speaks to the time and place that it was made whether it be from the Victorian era or the Dynasty/Dallas 1980’s. I fell in love with snake jewelry because of the baby sitter that stayed with my brother and I when my parents went off on their world travels. She was an original hippie Deadhead with an old BMW 2002. 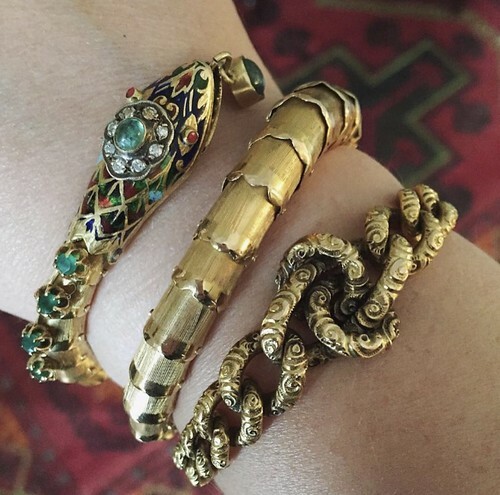 She had this amazing jeweled gold Victorian snake coil bracelet that she inherited. She’d casually wear it on her upper arm with jeans and a beat up tank top. I convinced her to let me borrow it for my senior prom. I hated my dress and my date, and the hairstylist screwed up my updo but it was worth it because I got to wear the snake. That snake bracelet is simply stunning. I would agree with you that jewellery should envoke an emotion, regardless of it's good or bad.